Wind-blow weed seeds from plants like these abound on the Oregon prairie, soon crowding out agriculture if not kept under control. 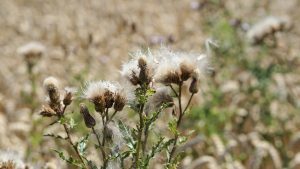 The Sherman County Weed District supervisor is responsible for preventing the establishment and spread of noxious weeds in accordance with County, State, and Federal weed laws. The Weed District was established to encourage and assist noxious weed control projects and education programs. District staff cooperate with governmental agencies, private agencies, and individuals to develop weed control measures and project long-term effects on the economic wellbeing of Sherman County.